Zenkimchi may have the best rundown on Korean Christmas cakes this year, but I''m able to show you something a little different. This tiny Christmas bundle of joy was baked by my mother, brought over by my father and has been maturing for a month or so (as all good Christmas cakes should). 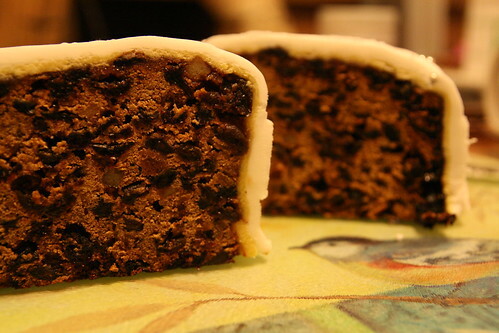 A dense fruitcake covered in a layer of marzipan and then a layer of fondant icing makes for a delicious way to celebrate the seasonal holidays. I have no need for ice cream cakes or fresh fruit sponges, this is the perfect cure for the wintertime blues. 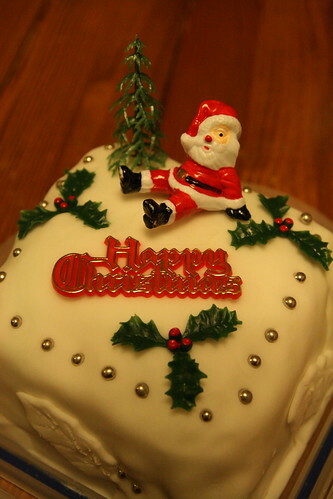 The Christmas cake looks gorgeous! Could you post the recipe of the cake later if you don't mind? Thanks. BTW, what do you mean by 'maturing for a month'? Is it like you put it in the refrigerator? This kind of fruit cake improves over time, you don't need to put it in the fridge, just in a cool place in an airtight container. Then leave it for a few weeks. You can also "feed" the cake, that's when you poke holes in the bottom and let it absorb a shot of whiskey or brandy every week. You end up with a delicious and rather intoxicating cake. posted in a post on..